I said recently that fake tan wasn’t really my thing, and its not to be honest. I’m extremely pale though and in the summer I look a little out of place and I just feel as though I need a bit of a bronze. This stuff is pretty damn cheap for the quality of the product. 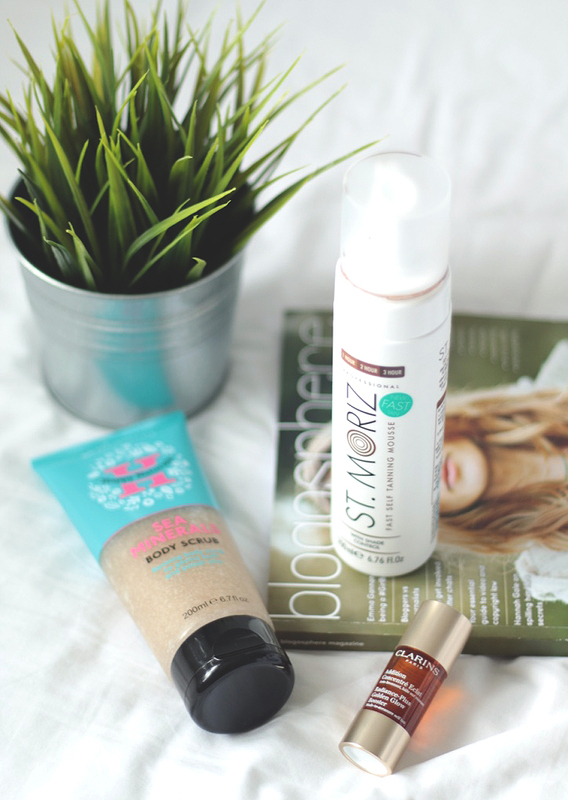 I was previously using the St Tropez In Shower Tan but I wanted something a little more instant than a gradual tan. This has been really great to be honest, it smells like peaches when you’re applying it which is amazing! Its a little scary when first applied as its quite dark but thats just so you know when to apply and it helps to avoid streaks and patches. You can leave this for up to 3 hours for a dark tan or 1 hour for a bronzed look. I left it on for an hour and it really worked for me. It gave me a lovely bronzy glow which wasn’t orange either (bonus), nor was it patchy or streaky. If you’re looking for a cheap fake tan I’d highly recommend this! Before tanning its a really good idea to scrub away any dry/dead skin. I saw this in Sainsbury’s believe it or not, and it was cheap soo I picked it up. I wasn’t expecting much from this but its brilliant. Its not too gentle but not overly harsh on the skin so its easy to scrub off any dry skin. The smell reminds me of Harribo Tangfastics as well which is a bonus! I’ve never tried anything from Clarins before but so many bloggers rave about the brand that I didn’t mind spending almost £20 on these little drops. This is a fake tan for your face essentially, I could just use my regular fake tan on my face but I’m too scared. You pop 2-3 drops of this in your moisturiser and massage it into your face as usual. The next morning you should wake up with a lovely bronze glow on your face. I do enjoy using this product and I think its much more efficient than just slapping regular fake tan on your face, and I assume its better for your skin. What are your go-to fake tanning products?